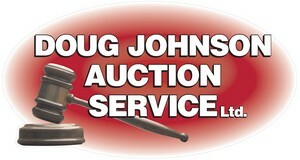 Neil and Betty May in Daysland, Alberta by Doug Johnson Auction Service Ltd.
Previewing starts Wednesday, June 12. Note the 4:00 p.m. start time. Equipment & Online Bidding at 5:30 p.m.
40' Bourgault 5710 Series II air drill (2004) w/ Bourgault 6350 TBH cart (2006), 800/65R32 rears - 540/65R24 fronts, Topcon X20 monitor, sgl shoot w/ NH3 (Raven rate controller - 1 season on valve), 2 seasons (2200 acres) on Dutch Precision openers, 9.8'' spacing, 4-1/2'' steel packers, full secondary blockage, dual fan, (sells w/ 18'' MRBs & dbl shoot air pkg - not installed), SN drill 37973AH-23, SN cart 38757AS-11, Terms: 30% non-refundable deposit, balance by Dec 31/19.